The microStation bridges the divide between the workstation and micro ranges beautifully. Fun with a capital F but capable of serious results. Intuitive and immediate yet deep when required. Equally at home on stage or in the studio. Hands up who likes mini keys? Menu-driven approach to sound editing. Those old enough to remember the arrival of Korg's legendary M1 will know that the 'Workstation' tag it gave birth to is an accolade Korg only applies to keyboards which combine synthesis and sequencing - in other words, those instruments they consider a one-stop shop for track creation. Fast forward to the here and now and Korg has developed a second series of instruments, the 'micro' range, which includes the microKorg and microKorg XL synths/vocoders and the microSampler, all of which combine serious sound-making potential with ease of use and a fun factor. Combine the two concepts and you end up with something pretty exciting - an instrument capable of producing tracks and editing sounds 'internally', while also offering immediacy and an intuitive approach without bogging the user down in endless menus. Enter the microStation - Korg's latest addition to both its workstation and micro ranges, which promises to do all of the above and more besides. Appearance-wise, the microStation has a foot more firmly planted in the micro camp than it does in that of its workstation big brothers. It's a slimline, lightweight instrument, featuring 61 mini keys and a remarkably shallow depth - about the same as the length of a DVD case. The top surface features a central two-line LCD display in the middle, with a sound 'ladder' to the left to display which category of sound you're currently playing, with the internal sequencer transport buttons below. To the right, a series of small grey buttons and corresponding LEDs keep you in touch with selected timbres, while to the left, a matrix of three rows of four parameters can be manipulated in real-time by four prominent rotary dials, with a selection button to jump from one row to the next to their left. A pitch-bend/modulation joystick lies in the top-left-hand corner while, round the back, you'll find stereo outputs, MIDI I/O, a USB connector for instant plug-and-play MIDI transmission to your DAW and an SD card slot for data load/save. All in all, the compact nature of the instrument is both a success and a frustration - there's a lot packed into a slender space to complement the other micro products, but we're yet to find a keyboard player who likes mini keys. If there had to be a compromise here, we'd have preferred an octave fewer notes in favour of full-size keys but, as gripes go, it's by no means a deal-breaker. As previously mentioned, sounds are organised into nine categories, from synths to basses to leads to drums and so on. These all employ Korg's EDS-i sound engine and there are 480 presets in total awaiting you when you switch on, with room for 512 sounds in total. The microStation's presets are well chosen, offering a good balance between dance music sounds and more obviously 'workstation' tones such as pianos (acoustic and electric), guitars, basses and wind, brass and orchestral sounds. Programs can be edited via the LCD screen, using the 'compass point' navigation buttons to its bottom right. Having selected a sound, a single click right takes you into Program Edit mode, with the up/down keys then providing a ladder between edit parameters for a sound's synth components, such as the Filter or Amp EG modules, to name but two. When you've found the section you want to edit, a further click 'right' takes you into that area, with the editable parameters in each section again selectable up and down. If you're new to synthesis, this might prove a bit fiddly, but having played with a lot of menu-driven synths, we found it reasonably intuitive, especially as arrowing left quickly gets you back to where you started. That said, a full software editor will be available from Korg shortly which should make life easier still. "The microStation's presets are well chosen, offering a good balance between dance music sounds and more obviously 'workstation' tones." Those of you familiar with Korg's architecture will know that sounds can be played in either single (Program) mode, or combined (Combi) modes, with the latter letting you split sounds across the keyboard or create stacks for extra power. To aid the process of sound selection and to introduce you to the capabilities of the real-time controls, each sound features its own Audition riff (user-selectable from a huge list of alternatives) which immediately gets it playing a sequence or phrase that can then be manipulated, which is a great place to start and often leads to interesting composition ideas too. Sounds are most 'musically' manipulated in real-time via the dials to the left hand side, with the top row dedicated to cutoff, resonance, EG amount and EG release, while the middle row features four user-definable parameters. One word of warning is that these encoders can jump suddenly if you need to use the same physical dial to control two parameters. For instance, if you use the one on the left to control cutoff and move this towards a low setting, if you then arrow down to use the same dial to control the amount of effects send and turn this right up, when you return to cutoff, the sound will open to super-bright the moment you touch this dial again, as its physical position is now at maximum. We couldn't find a way to switch the microStation to relative mode, so hopefully this might be something for Korg to address in a future firmware update. Next to the Audition button you'll find the in-built arpeggiator. There are 640 arpeggiation patterns built-in, a total from which you can select a preset or create your own. The presets are organised into instrument type patterns, though there's nothing to stop you applying a bass pattern to piano part or vice versa. The bottom row of real-time controllers is dedicated to arpeggiation functions, with knobs to control Arp Gate time (how long each note lasts), Arp Velocity, which varies the dynamic range of a pattern, Arp Swing and, finally, Arp Tempo. The news gets better though, as microStation actually features dual arpeggiators, meaning that two completely independent arpeggiation patterns can play at once, so you can either layer a synth sequence with an accompanying pad, for example, or split the keyboard in Combi mode and assign a pattern to a bass and another to a lead. This also applies to the internals that can use both arpeggiators within its arrangements. The internal sequencer is capable of playing back up to 16 tracks of notes and one master track containing tempo and time signature data, which can be collectively saved to one of 128 songs. What becomes clear straight away is that several types of arrangement can be created with the sequencer, whether you want to hit record and build up a multitimbral 'song style' arrangement, or whether you're more interested in building short looped phrases which you can then expand out to a fully-fledged track or use to spin into a DJ set, for example. "The internal sequencer is capable of playing back up to 16 tracks of notes and one master track containing tempo and time signature data." If the latter sounds more like you, you'll find a dedicated Loop button which cycles around an area of your choosing, while the Grid Seq button activates a running light style sequencer to allow you to create basslines, beats or sequence patterns on the fly, which can then comprise one of the instruments in your track. Switching from one instrument to another takes place via the function buttons on the right-hand side, while editing of parameters works as it does in the other edit modes - arrow down to choose parameters such as part level, pan and effects routing. Also within the sequencer menu, you can specify automatic quantise so that if you want to build loops in the studio or onstage on the fly, timing correction can be applied in real-time as you layer parts. The tracks within each song can also access microStation's impressive effects section. There are 134 effects types, which are organised into five insert effects, two master effects and one 'total' effect. Not all effects can be loaded into each slot, so it's not possible to load eight reverbs to a single sound, for instance, but a sensible channel strip style approach is employed instead, which shouldn't prove too frustrating. Effects operate differently in each mode, with Program mode the least restricted. A single sound can route a sound through all five inserts, both master effects and the total effect if you so desire. Both Combi and Sequencer modes share these effects instead and employ effects busses to decide which sounds get sent to which effects and the amount of effect applied to each. Additionally, microStation features a Dynamic Modulation system, which enables you to assign specific effects parameters to real-time controls or MIDI controller numbers so that they can be affected using the controllers, the joystick or external devices. Pretty powerful stuff. The microStation is a revelation and, in our opinion, a total success. 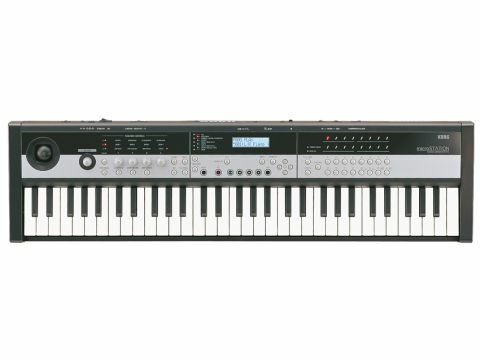 It manages to straddle the divide between full-blown workstation and worthy addition to Korg's micro range effortlessly and packs a feature set which is inspirational, creative and fun. What's so impressive is that there's something here for everyone - lots of people will consider this a dance synth with a sound set and sequencer/ arpeggiator functions to match, but it's equally capable of providing you with pianos, winds, brass and a more song-led approach to combining these sounds to act as a backing tracks for pop gigs. The biggest compromises are the mini keyboard and the LCD menu-driven approach to sound editing, but if you're serious about the latter, you'll undoubtedly turn to the software editor, and if you're too vexed by the former, there are more grown-up workstations, with keyboards to match, higher up Korg's product line. We rather suspect, though, that the microStation is here to stay.